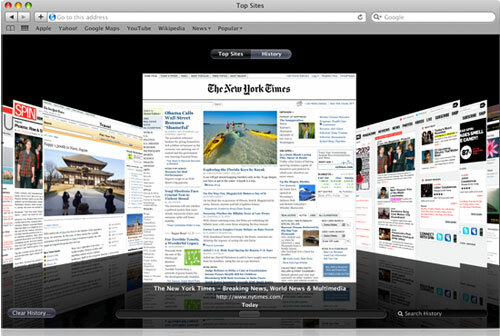 The Wall Street Journal reports that Apple has added a "do-not-track" privacy tool to the latest test version of their web browser Safari found in Mac OS X Lion. The tool is included within the latest test release of Lion, a version of Apple's Mac OS X operating system that is currently available only to developers. The final version of the operating system is scheduled to be released to the public this summer. Mentions of the do-not-track feature in Apple's Safari browser began to appear recently in online discussion forums and on Twitter. Mac OS X Lion is currently in private developer seeding and is due to the public later this summer. This "do-not-track" feature was originally proposed by the FTC and is a voluntary system in which web browsers broadcast this "do-not-track" preference but its up to advertising companies to actually comply with the request. Do-not-track tools in browsers automatically send out messages to websites and online-advertising networks requesting that users' movements around the Web not be tracked. The system will only work if Web companies agree to respect peoples' tracking preferences. According to the WSJ, major online ad networks have yet to agree on how to honor the system. Apple's Safari is the 3rd major browser to support this initiative, following Microsoft's Internet Explorer and Mozilla's Firefox. Google's Chrome has yet to commit support to the feature. I like people who actually realise that the annoying advertising is actually the price you pay for so much quality internet content. I wonder how long MacRumors and other similar sites would last without the income they get from advertising? The less effective online advertising becomes (through restrictions on tracking or adblockers), the less money will be put into the medium. I would personally pay a small fee to for macrumors if I got no advertising && I didn't have to read posts from users such as yourself.